Mix them all together and voilà — instant aneurism! I’m not sure which is a more salient critical experience: disappointed expectations (The Nice Guys), fulfilled expectations (Mad Max: Fury Road), or confounded expectations (John Wick). Why bother with originality, John? Isn’t it time you supported Hollywood’s Green Movement? Think of all the multiplex garbage out there in need of reusing and recycling that would ultimately reduce an audience’s capacity to store waste. It’s cheaper and more effective than a lobotomy. Mix them all together and voilà — instant aneurism! The good news is they’re burying it, but I promise to be there next January for the Friday the 13th premiere. Animator Chris Wedge’s (Ice Age, Robots) first feature with a human cast successfully mixes live action and animation to produce a family film that isn’t a monstrous trek. 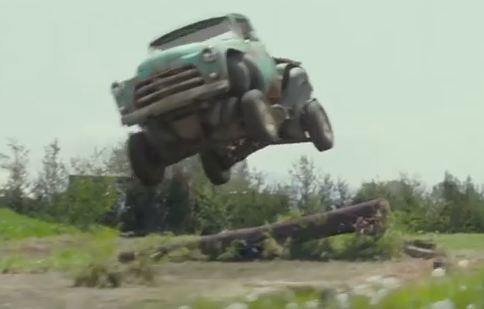 High school senior Tripp (Lucas Till), eager to shake the dust of his crummy little town off his feet, spends his free time combing junkyards for the parts needed to slap together a janky pickup. 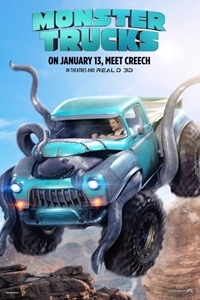 An accident at the local oil-drilling company releases the good-natured tentacled blob named Creech, a flubbery, oil metabolizing creature that attaches itself to the Trippmobile’s undercarriage. Originally slated for a May 2015 opening, the release date was regularly pushed back to accommodate post-production work. When Viacom took a hit in its third-quarter earnings for 2016, Monster Trucks took the blame. Too bad, because audiences could do (and have done) a lot worse than this genial throwback to a time when Kurt Russell was Disney’s #1 living, breathing attraction. With Jane Levy as Tripp’s saucer-eyed love interest.